This programme incorporates more incredible footage of massive, heavy-duty tractor-trailer combinations operating across the Australian continent. 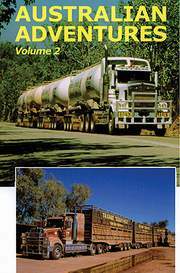 Beginning in Western Australia, the DVD shows a Kenworth K-100G twin-steer, tri-drive dromedary unit hauling a 2AB Quad trailer to the gold mines north of Kalgoorlie. Next stop is Australia's Northern Territory, where the Mighty Atom, an impressive 2AB four-trailer tanker train hauled by a tri-drive Kenworth tractor, is captured hauling its load through the wilderness of Kakadu Park. Finally, in McKinlay, Queensland - an area famous for being home to the Walkabout Creek pub visited by Crocodile Dundee - the CP team filmed a Mack Titan six trailer [!] road train operated by McIver Transport. Also included are two- , three- , and four-trailer road trains hauled by Scania - Volvo - Kenworth - Mack - International - Western Star - Ford.